A master class enables instructors to share the classes with TAs or co-instructors throughout sections. The master class instructor can set up sections for the other instructors. These instructors are referred to in the master/section class system as Teaching Assistants (TA’s), or each TA can create a section by using the master class ID and a TA join password set by the master class instructor. Each TA can only access his/her single section of a master class; but the master class instructor can access all of the submissions to every section. The creation of a class is the first step to access & use Turnitin. A class is equal to course & the instructor should create a single class for each course & expire each one at the end of sem. according to the nature of the assignment. Choose "Master Class" from the "class type:" pull down menu. Enter the name for the class (the name of the course). Enter the TA join password. Select the subject area that best fits the class. Select the student level that best fits the class. Select the end date for the class (it should be the end date of the semester).Once the end date has passed, the class will be expired & not accessible for submissions. Class information will be displayed in a pop-up window containing the ID and join password for confirmation (should be sent to TAs or co-instructors to join the class & create sections on your behalf). 9. Now you can view your class on your homepage. Students will not be able to enroll in the Master Class directly, they must enroll in a section class which must be created separately, after creating the Master Class & then they can be informed with the section ID & enrollment password. New sections can be manually created by the master class instructor. Only one TA can be assigned per section. Click the "add section" link to the right of the name of the master class. On the add section screen, enter all of the following information: TA’s first name TA’s last name TA’s e-mail address (for notification or new user password e-mails). Click "submit" to add the section to the master class and send the assigned TA a welcome notice or new user notification e-mail. The TA will only be e-mailed a password if they have no user profile existing under the e-mail provided for them in the TA information section. Each new section will will appear on the instructor homepage beneath the master class & will have a unique class ID & enrollment password that should be sent to students related to each section. When a section is added, an e-mail with the section information will be sent to the TA. 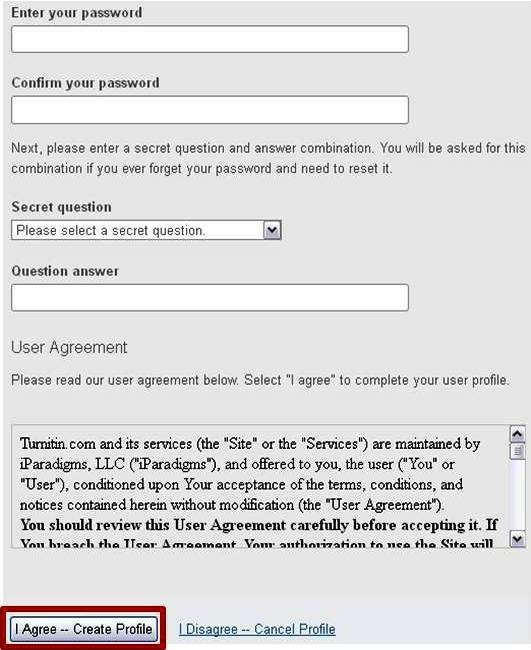 If the TA does not have a user profile on Turnitin, Turnitin will generate a new user profile for the TA and including the new user password in the e-mail sent to the TA. .
To allow TA’s to create their own sections under a master class, the TA’s must be provided with the master class ID number and the TA join password set for the master class(refer to step no.8 above in creating master class). Click on “Create Account” link in the upper right corner. On the next window, where it says “Create a New Account” choose the “Teaching Assistant” link. 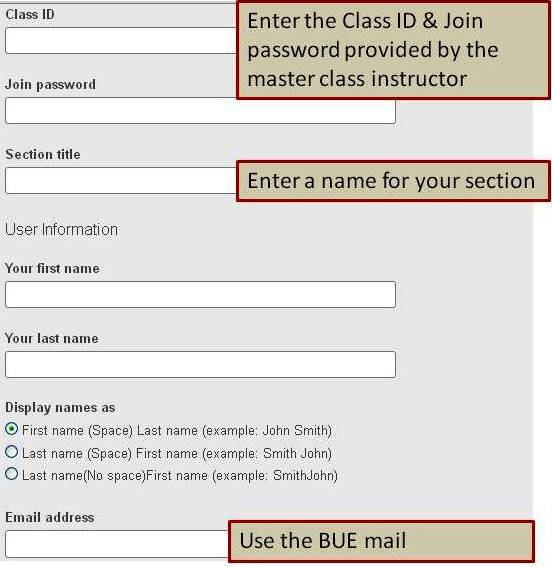 Fill in the required information: the master class ID, join password, section's title, personal info as shown below & then press "I Agree" to complete your profile. After logging in, the section will show on your instructor homepage. Click on the section's name to view/create assignments. Click on the "Join Account (TA)" tab, enter the Master Class ID and the TA join password and click "Submit." Enter the name of the section class, create an enrollment password (for your students) and click "Submit." The new section class will be created and a section class ID number will be assigned. Click on the class name to view/create assignments. Within a master class, you as a master class instructor can set up assignments or in each section as well. If the assignments are set up within the master class, the master class instructor will need to "push" the assignments to the sections. For an overview on assignment creation, please see the page of creating assignments. Click on "New Assignment" button to create your asignment. Refer to the page "Create an Assignment" to set up your assignment. In the Optional settings, in the create assignment page, click to push the assignment you are creating to the sections or to save it for later. Complete the steps of creating your assignment & click "Submit"
The master class homepage displays all assignments created in the master class. The "assign to sections" column shows whether an assignment has been pushed to sections and whether it has been pushed to all or only selected sections. "Not Pushed" indicates that an assignment has not been pushed to any sections. "Fully Pushed" indicates that an assignment will appear in all existing sections. "Partially Pushed" indicates that an assignment has been pushed to one or more section(s), but not to all sections. On the master class homepage, Click on the green plus icon under the "Assign to Sections" column. Select (or deselect) the "Push Assignment Dates" check box. Note: If you select the "Push Assignment Dates" check box, the Master Class instructor will push the assignment dates set in the assignment creation process. In case of deselecting the "Push Assignment Dates" check box, the TA assigned for each section should set the assignment dates before students in each of those sections can submit to the assignment. Select (or deselect) the check box next to each section name to push to that section. Note: By default, all sections are marked to receive the assignment. To not have the assignment pushed to a section remove the check mark from the check box before clicking submit. The assignment will not be pushed to that section. Use the "Submit" button to "push" the assignment to the selected section(s). The assignment is now "fully pushed" with dates to all sections. The master class does not allow students to enroll. Students can be enrolled into the sections of the master class in the same ways as students enrolling into standard classes and will see each section as a separate class. 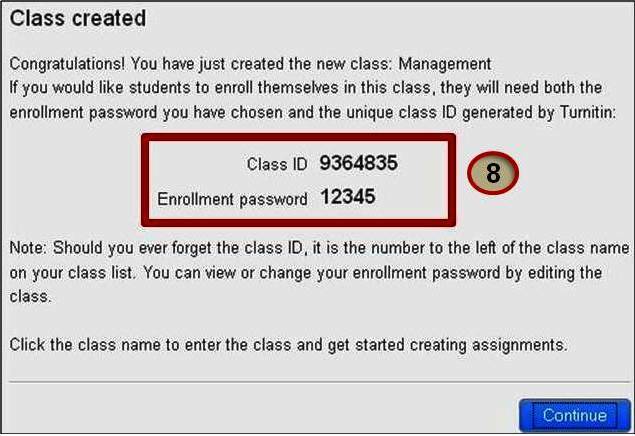 Self-enrolling by using "Enroll in a class" option if they already have had accounts on Turnitin or "Reset pasword" option if they forgot their passsword; but if they were 1st time users, then they should create a user profile using the section ID and section enrollment password. Students can be added to the section class by the TA or by the master class instructor one by one or as a list. Step by step instructions can be found in Enroll Students page. The master class instructor may also add students to sections either individually or via uploading a list & then adding them to a specific section of a master class. From the instructor homepage, click on the master class name. Click on the "students" tab to open the student list for this section. Click on the "Edit" icon for the class. Click on the button labeled "Collapse to Standard Class". Your class will now be a standard class & will take on the section’s class ID number and enrollment password. Note: A Master Class can only be collapsed to a standard class if there is 1 section class under it. If there are multiple section classes listed, or no section classes at all, the option to collapse will not be available. 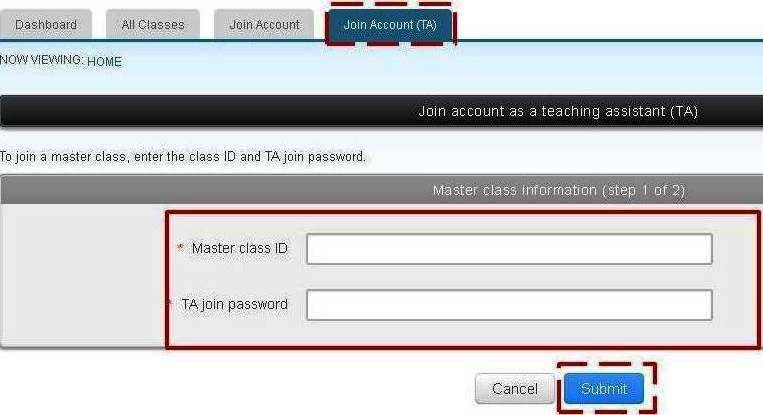 When creating a class on Turnitin, please inform your students with the class ID & enrollment password of your class on the e-learning or via the BUE mail so they can enroll successfully using their BUE mails within a period of time, then change the password secretly so that they won’t enroll again using other accounts.